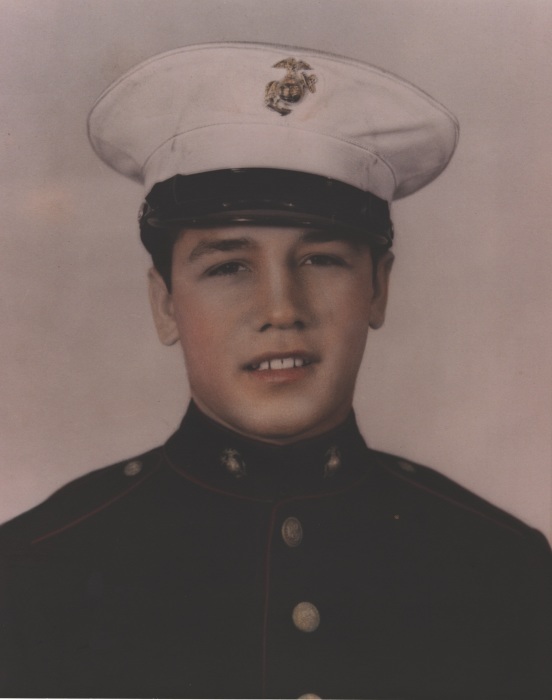 JACKSONVILLE - Sergeant Major Domenick A. Irrera, USMC (Ret), 92, of Jacksonville, NC passed away Saturday April 6th 2019 surrounded by family and friends at Lower Cape Fear Hospice in Wilmington, NC. A funeral mass will be said at 11:00 AM on Thursday at Infant of Prague Catholic Church, 214 Marine Blvd, Jacksonville, NC. Burial, with full military honors, will follow at Coastal Carolina State Veterans Cemetery at 110 Montford Landing Rd., Jacksonville, NC. Born May 15th 1926 in Philadelphia, PA, Sergeant Major Irrera was the son of Gaetano and Elvira Irrera. Sgt. Maj. Irrera was proceeded in death by his wife Janet Goetz Irrera. He is survived by his children Cathy Irrera Nicholson (Jim), Joseph Anthony Irrera (Sheila), Thomas Gilbert Irrera (Erika), and Domenick Jack Irrera. Sgt. Maj. Irrera was proceeded in death by his daughter Gloria Irrera Benvenuto. Sgt. Maj. Irrera was blessed with 12 grandchildren, Kyle Nicholson, Kristin Irrera, Joseph Irrera, Kalyn Nicholson Snow, Shelby Nicholson Hollingsworth, Dante Benvenuto, Nicholas Irrera, Emily Nicholson, Andrew Irrera, Joshua Irrera, Michaela Irrera and Eva Irrera. His family continued to grow with 4 great grandchildren, Noah Irrera, Holden Hollingsworth, Emsley Snow and Gabriella Irrera and 3 more great grandchildren to be born this year. Sgt. Maj. Irrera served in the United States Marine Corps for over 40 years. He retired on June 29th 1987 and at that time was the last active duty Marine to serve in World War II. He ended his career as the senior enlisted man for the Fleet Marine Force Atlantic. His personal decorations included the Legion of Merit, Navy Commendation with Combat “V” and two stars, Navy Achievement Medal, Good Conduct Medal with one silver star and two bronze stars, Combat Action Ribbon and various World War II and Vietnam awards. Sgt. Maj. Irrera was also known for his love of running. In 1984 he was honored to carry the Olympic torch on its way to the Olympic Games in Los Angeles. Sgt. Maj. Irrera completed over 50 marathons, countless half marathons, 10Ks, 5Ks and trail races. In 2008 he was inducted into the Marine Corps Marathon Hall of Fame. He was an active and proud member of Jacksonville’s Trails and Greenways Committee and later as a member of the Recreation Parks Advisory Committee. Sgt. Maj. Irrera had attended all the Run for the Warriors events since they began in 2006 and ironically passed away on race day 2019. The family will receive friends prior to the funeral mass on Thursday at Jones Funeral Home, 303 Chaney Avenue in Jacksonville, from 09:45 to 10:45. The family requests in lieu of flowers, memorials be made to Lower Cape Fear Hospice, 1414 Physicians Drive, Wilmington, NC 28401.